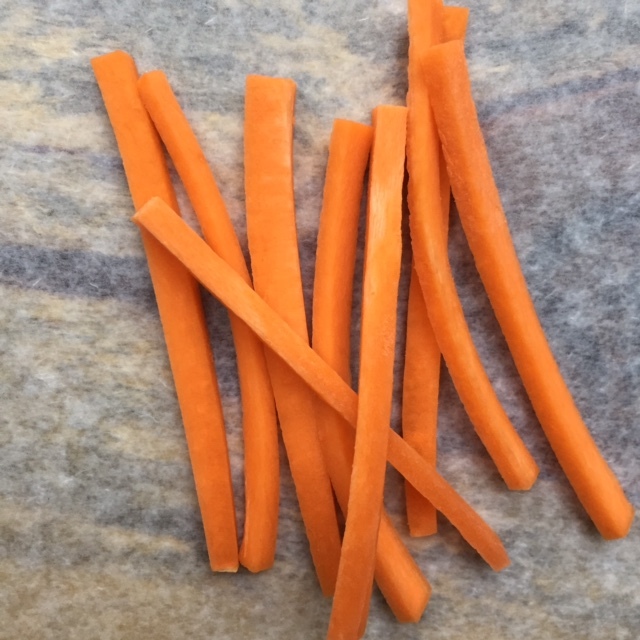 Cutting a carrot into a julienne shape is one of many shapes used in French taillage, or the method to achieve even knife cuts. It’s important to cut your veggies into uniform shapes because it’s not only aesthetically pleasing, but it also ensures even cooking. With taillage, practice makes perfect! So continue to work on your knife skills and you’ll be a pro before you know it. 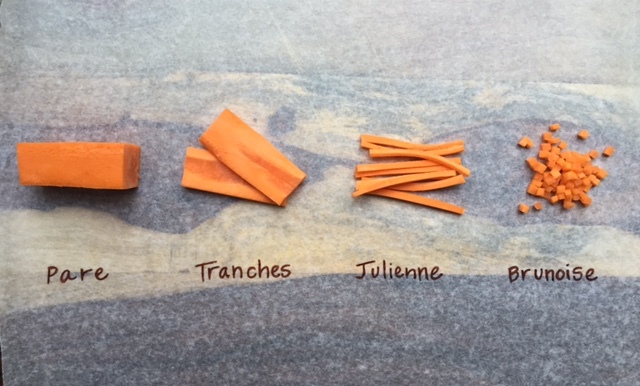 So here’s how to julienne a carrot. 1) First, wash and peel the carrot and cut it into 2 inch sections. This means to tronconner in French. 2) The second step is to turn the round sections into rectangles. To do this, cut off the rounded sides (as little as possible), one side at a time, to make an even surface. To square off the carrot is to parer in French. This step is important so you have a level surface to work on, and so even pieces can be uniformly cut. 3) Next, slice the sections into 1/8 inch (1 mm) planks, or make a tranches in French. Depending on the size of the carrot, you should end up with anywhere from 4 to 6 tranches. 4) The final step is to cut each tranches into matchsticks 1/8 inch (1 mm) wide, or julienne in French. At this point, you can also cut the julienne pieces into a brunoise, or into very small cubes (1 mm x 1 mm).